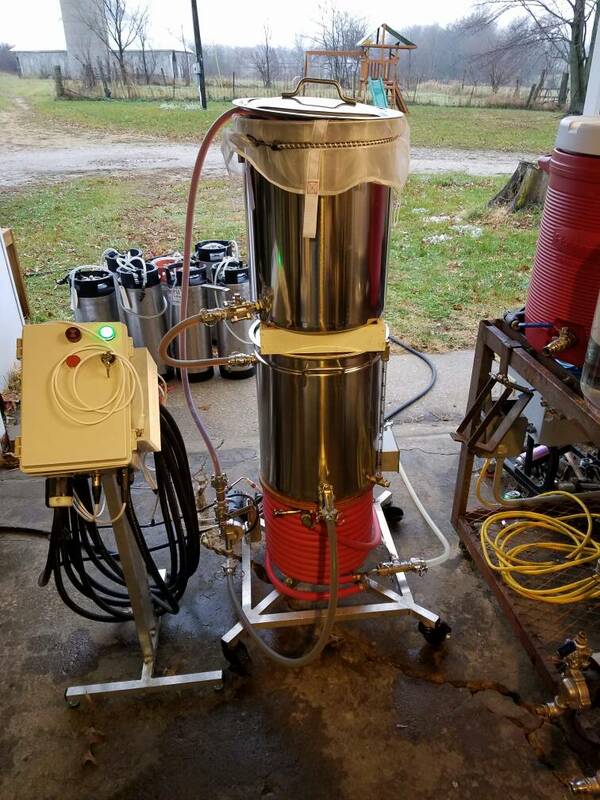 Was wondering what everyone's thoughts were on a kettle rims (breweasy like) setup, as far as low o2 that is. I would think with 2 good mash caps that it would be pretty efficient with o2 ingress and give the ability to control mash Temps. Thoughts? Went ahead and tried it. I am going to call it a win. I didn't have time to test for residual smb, but by the color and flavor my 20 ppm charge was adequate for a long rims mash. 2nd batch was a success as well with 20-30 ppm smb on a weissbier. Would love to get the SMB <20 ppm. Now if I can just get the step mash attenuation issue ironed out. Seems you have two minor points to control. One is when you fill the boiling kettle, exposing the initial liquid, if you fill from the bottom (are you), and then when you drain most of the liquid into the boiling kettle, some volume will slowly drain into the bottom of the mash kettle and will interact with oxygen (unless you divert it to a separate container for use as a starter?) - this is a similar problem with BIAB. Did I get them right? How are you dealing with these issues? lupulus wrote: Seems you have two minor points to control. My boil kettle never goes empty and is always under a cap (until boil that is and back under a cap during chilling). My Mt fills the Bk via whirlpool arm below the surface and cap. I loose about a qt to the Mt that doesn't make it to the boil. I have done a stout with 20 ppm smb and maintained low o2 malt and hop character, don't know if I want to try a lower dose than that. Natebriscoe wrote: Was wondering what everyone's thoughts were on a kettle rims (breweasy like) setup, as far as low o2 that is. I would think with 2 good mash caps that it would be pretty efficient with o2 ingress and give the ability to control mash Temps. Thoughts? Many processes will work, if you focus on controlling the critical points and exposure. Some methods just lends themselves better to lodo, but most obstacles can be overcome.